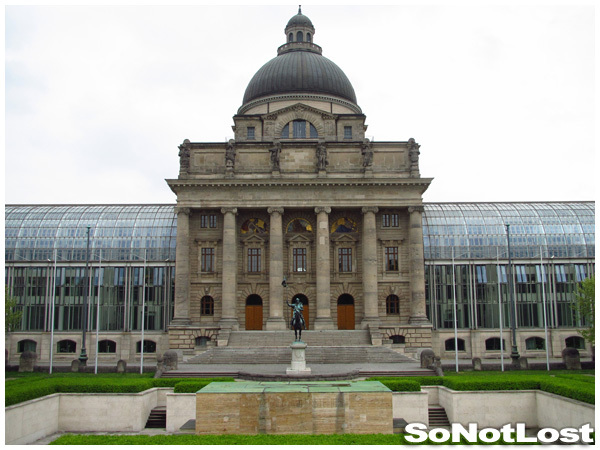 TravelTuesday Picture of the Week: Bavarian State Chancellery (Munich, Germany) | So Not Lost! The Bavarian State Chancellery (in German: Bayerische Staatskanzlei) is located on the eastern side of the Hofgarten in Munich. The central part of the building, including the dome, was part of the Bavarian Army Museum which was built in 1905 by Ludwig Mellinger. The rest of the building was destroyed during World War II, but the central dome part was restored in 1982. Modern glass wings were attached to each side and the building was completed in 1992.